One of the greatest gifts a parent can give a child is to help him or her become “emotionally articulate” so they can recognise, express and manage their feelings. Emotional intelligence (EQ) is arguably more important to get through life than IQ and employers are increasingly looking for ways to measure EQ when recruiting. 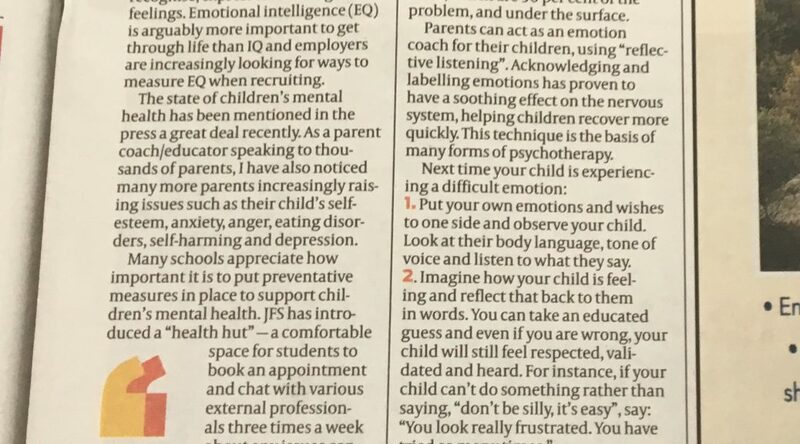 The state of children’s mental health has been mentioned in the press a great deal recently. As a parent coach/educator speaking to thousands of parents, I have also noticed many more parents increasingly raising issues such as their child’s self-esteem, anxiety, anger, eating disorders, self-harming and depression. Many schools appreciate how important it is to put preventative measures in place to support children’s mental health. JFS has introduced a “health hut” — a comfortable space for students to book an appointment and chat with various external professionals three times a week about any issues concerning them. Sixthformers are trained to deliver programmes to support the younger years. At Immanuel College, year heads are trained in mental-health issues such as anxiety and eating disorders. The whole Immanuel community is taught about respecting and valuing the importance of good mental health and how to achieve it. The most effective way to respond when a child of any age is experiencing a difficult emotion is to acknowledge your child’s perspective and empathise. You don’t have to agree or give in. 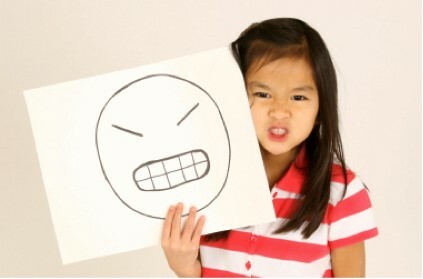 However, during meltdowns, it is the worst approach for parents to deny feelings, give advice or ask questions. What children need first is empathy: acknowledge their upset so they feel heard and understood. Using the analogy of an iceberg, the tip is a child’s behaviour: this is what parents tend to react to. Instead, parents need to address the main issue, the child’s feelings and emotions, which are 90 per cent of the problem, and under the surface. 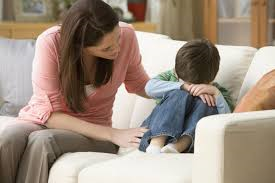 Parents can act as an emotion coach for their children, using “reflective listening”. Acknowledging and labelling emotions has proven to have a soothing effect on the nervous system, helping children recover more quickly. This technique is the basis of many forms of psychotherapy. 1. Put your own emotions and wishes to one side and observe your child. Look at their body language, tone of voice and listen to what they say. Parents mainly want to fix the problem quickly and make it go away. However, it is better to listen first and talk through the emotion. Address the unwanted behaviour and problem-solve later. Emotions are there to be felt and then they can move on. It takes practice and determination to stay calm and empathise, especially during tantrums and meltdowns. It is the best tool a parent has — to communicate, connect and encourage children to be more emotionally articulate. Do this effectively and the impact on your child’s long-term mental health and well-being will be enormous. Emotion coaching can also be known as ‘Reflective’ or ‘Active’ listening. This is a way for parents to respond when a child is having an uncomfortable feeling. It enables a child to recognise and articulate an emotion so they can move more quickly towards accepting and problem solving. What are the benefits of Emotion Coaching?